I started learning the piano from an early age, by performing at the Maidenhead and Slough Music Festivals. At the age of thirteen I won a top music scholarship to Downside School, near Bath. While there I continued performing in music competitions in solo classical piano, jazz ensemble and saxophone (which I took up as my second instrument). I completed my graded exams at the age of fifteen, achieving a Merit with the Associated Board of the Royal Schools of Music (ABRSM). I began teaching piano in 1999, as well as continuing with music studies (gaining a CT ABRSM and a DipABRSM) believing that it is important to stay dynamic and flexible with new teaching ideas. 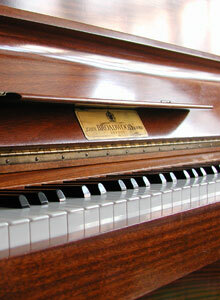 Piano Playing (formerly Harmonics Pianoforte) was established in 1965. The teaching philosophy at Piano Playing emphasises enjoyment, progress and individual learning styles. All beginners are guided through their initial learning stages by a book written in the 1970s by the founder. It has been very successful in helping pupils at the early stages of learning and is still in use today. It can also be purchased for £8 (including P&P). Lessons are one-to-one and last from 30-45 minutes on a weekly basis in blocks of six lessons. Parents are encouraged to be present during teaching in order to gain first hand knowledge of progress and how they can help shape and support their child’s practice sessions at home.